UPDATE: Read about changes to the Mayor’s proposed budget based on our advocacy, and what you can do now, at this link. The City of Boston has made real progress toward changing its official policies to make riding a bike in the city easier and safer, but changes to our physical infrastructure have been far too slow. In the City’s GoBoston 2030 and Vision Zero Action Plans, Boston set forth several positive goals to achieve by 2030, including increasing bicycling mode share fourfold, ensuring that all households are within a 5-minute walk of a protected bicycle facility or shared use path, and eliminating traffic deaths. Unfortunately, for many people who bike in Boston today — or would if it were safer — there has been little visible progress on the ground. It is essential that there be a financial commitment to achieving the City’s stated goals. The City’s current employees are doing what they can, but insufficient staffing and resources are holding us back. This year, Boston allocated just $4.1 million for its Vision Zero Action Plan. That’s just over $6 per person per year towards ending traffic deaths in our city. Meanwhile, New York City has dedicated approximately $13 per person and San Francisco about $75. Boston is trailing behind cities that have been aggressive about building safe, protected bike infrastructure. New York City added 25 miles of new protected bike lanes in 2017, after adding 18 the year before. As a result, traffic deaths have decreased each year even as they rose nationally. Even Cambridge, with 1/6th the population of Boston, added almost as many miles of protected bike lanes last year. If Boston is going to end traffic fatalities, reduce greenhouse gas emissions, and make our city more livable, we need a drastic increase in the city’s funding for safe, protected bike infrastructure. What Could We Do with the Boston Bike Budget? The City’s 2013 Boston Bike Network Plan promised 35 miles of protected bike lanes by 2018 (21 miles of protected on-street lanes and 14 miles of off-road paths). It’s 2018, and only a few miles have been completed. At the current rate, it will take decades to build the protected bike lane network we need TODAY. With our proposed Boston Bike Budget, we could build more than a dozen miles of protected bike lanes each year. Today, 2.4% of Bostonians regularly bike to work, and with just 2% of the City’s $898 million streets budget, we could make major strides towards allowing people of all ages and abilities to bike safely in every neighborhood of Boston. Safety and Health: Protected bike lanes make everyone safer — they reduce injury crashes for all road users (people driving, walking, and biking) by 40 to 50 percent, and they reduce sidewalk bike riding by an average of 56 percent. And more people riding bikes means less air pollution and more physical activity, keeping Bostonians healthy. Economic Development: Protected bike lanes boost retail sales by making it easier to get to local businesses. After the construction of a protected bike lane on 9th Avenue in New York City, local businesses saw a 49 percent increase in retail sales. On other streets in the borough, the average was only 3 percent. Transportation: Traffic congestion cost the average Boston driver $2,086/year in 2017, and rush-hour commuters spent an average of 60 hours sitting in traffic. We can’t build our way out of congestion. Protected bike lanes increase biking by an average of 75% in the first year alone, appeal to 4-7 times as many people as bike lanes that are merely painted, and make driving less stressful, all helping to move people more efficiently on Boston’s crowded streets. Click here to see last year's proposal. We need your help to get Mayor Walsh to adopt our Boston Bike Budget! Send a personalized email (template below) to Mayor Walsh asking him to include the Boston Bike Budget in his budget this year, and forward the email to your local district city councilor and the four at-large (city-wide) councilors. Contact info is below. If you can, print out your letter, sign it, and mail it to the Mayor and councilors with a personal note asking for their support. Call Mayor Walsh’s office at 617-635-4500 and ask him to include the Boston Cyclists Union's Boston Bike Budget in his budget this year, and call your local district city councilor and the four at-large (city-wide) councilors to ask them to support it. Below is a script, and their contact info. Call, text, or email your friends, family members, or co-workers and ask them to email and call the Mayor and their city councilors, and post of social media. Here’s a sample message: “I just asked Mayor Walsh and the Boston City Council to support safe, protected bike infrastructure in the city’s budget. Join me in asking them to fund making biking safer and easier! Stay tuned for information on meetings with each city councilor that we’ll be setting up this spring! Click here to find out who your Boston City Councilor is (and get contact info). Below is a template for emails to Mayor Walsh. Please personalize it and add your own information. You can pick and choose which talking points, below, you actually include in your note. The more personal details, the more effective the letter will be. Don’t forget to forward it to your your local district city councilor and the four at-large (city-wide) councilors with a brief note asking them to support the Boston Bike Budget (look up their emails here). You can use the same content as speaking points when you call your councilors and Mayor Walsh. Thanks! As a resident of [YOUR NEIGHBORHOOD] who bikes [OR who would bike in Boston if it were safer], I’m writing to ask you to include the Boston Cyclists Union’s Bike Budget recommendations in your FY19 budget. The City of Boston has made real progress toward changing its official policies to make riding a bike in the city easier and safer, but changes to our physical infrastructure have been dramatically slower. 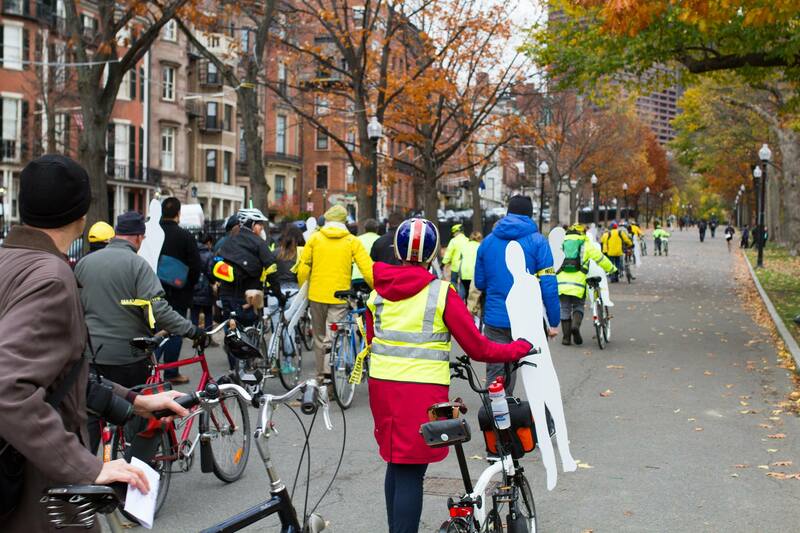 The City’s 2013 Boston Bike Network Plan promised 35 miles of protected bike lanes by 2018. It’s 2018, and less than 5 miles have been completed. The GoBoston 2030 proposes an ambitious network of protected facilities without any timeline, plan, accountability metrics, or funding needed to accomplish implementation. At this rate, it will take decades to build the protected bike lane network we need TODAY. The extra $1 million dollars allocated to Vision Zero last year for Neighborhood Slow Streets does nothing to change arterial streets, where people biking are disproportionately hit, injured, and killed. If Boston is going to end traffic fatalities, reduce greenhouse gas emissions, and make our city more livable, we need a dramatic increase in the city’s funding for safe, protected bike infrastructure. I hope you will include the Boston Cyclists Union's Bike Budget figures in your FY19 budget and help make Boston safe and friendly for people riding bikes.